It may take more than a two-run homerun during a Spring Training game to prove it, but Dodgers prospect Scott Van Slyke seems ready to take the final steps towards making his own name in the majors. 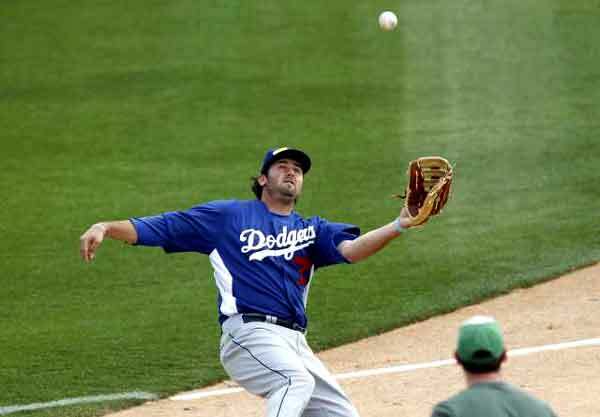 Son of former All-Star outfielder Andy Van Slyke, Scott has steadily (albeit slowly) been progressing through the Los Angeles Dodgers farm system since being drafted out of high school in 2005. The outfielder tore through Double-A ball with Chattanooga last season, blasting 20 home runs with a .427 OBP en route to being named the Dodgers Minor League Player of the Year. But while Double-A accolades are nice, Major League All-Star appearances are better. And who else to tell it better than his own father, Andy, who admits his continuous insights may have an adverse affect on his son. Whatever amount of information Scott has been using, it seems to be working. Prior to his breakout season last year, Van Slyke made a brief appearance with the Isotopes in 2010, collecting 11 hits in 12 games. He was selected to the California League post-season All-Star Team in 2009, and became the first player in San Bernardino professional baseball history to collect at least 40 doubles (42), 20 home runs (23) and 100 RBI. Andy Van Slyke also noted the ongoing pressure added by each year’s new crop of baseball prospects, advising Scott that although his plate-approach has improved since his earlier years, raw talent alone isn’t enough to become a big league star. All pressures aside, Scott Van Slyke has finally put himself in a position to make his regular-season Major League debut. After an impressive outing in the Dodgers Spring Training opener, Double-A accolades seem like a thing of the past. With a strong performance through the rest of the spring and a “hunger” to succeed at the plate, Van Slyke might finally begin to meet expectations. For both his father and the Dodgers organization.